Our transatlantic cruise on the Carnival Breeze began in Barcelona, and made several stops in other Spanish ports before beginning the trek across the ocean. Unemployment is quite high in Spain right now, so in some areas we saw quite a number of beggars. They need to make a living somehow, and look to tourists as a means of acquiring money. In Canada I once saw a beggar with two separate coin collecting boxes sitting in front of him and a sign that said “Who’s More Generous?” One box had a label saying men and the other women (the women box had more money in it.) 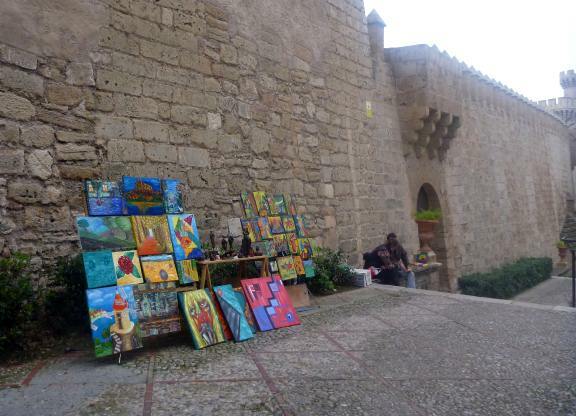 At the time I thought he was pretty creative compared to the rest, but that was long before I ever went to Spain. 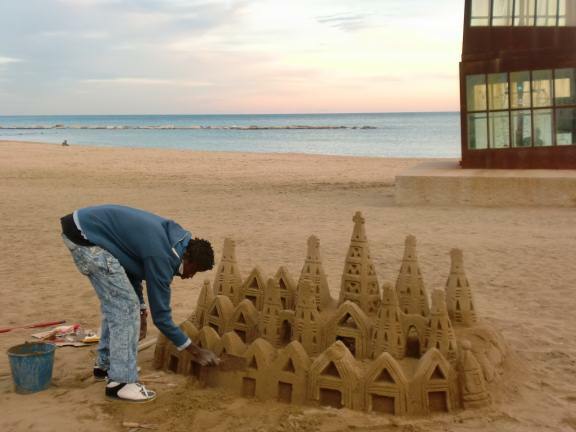 Walking along the beachside boardwalk in the Barceloneta area of Barcelona, we saw many intricate sand castles. Soon we noticed a collecting box with a few coins in it on the edge of the boardwalk by each castle. 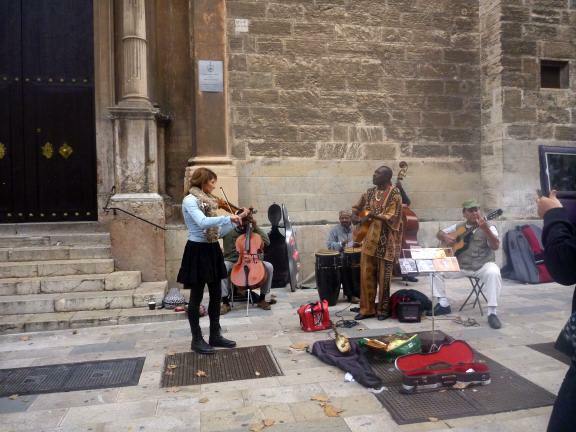 In Palma de Mallorca we did not go to any beaches, but the beggars in the old part of town all had their own style. Some sold art or trinkets, but that’s nothing new. Others though, they dressed up in costumes that got weirder and weirder as we worked our way through town. 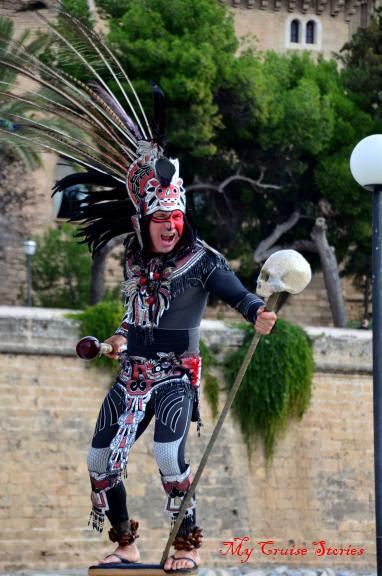 Initially we saw people near the La Seu cathedral dressed in some sort of costumes that looked like they belonged more in the Aztec area of Mexico. John took some pictures of the first one we saw. Most of the beggars we came across stayed fairly quiet, but that particular one quite aggressively panned for customers, and after John put a donation in his collecting tin for the photos the man loudly complained that it was not enough, keeping it up until he guilted John into giving him a bit more. Then we saw a lady in a fancy old-fashioned dress. 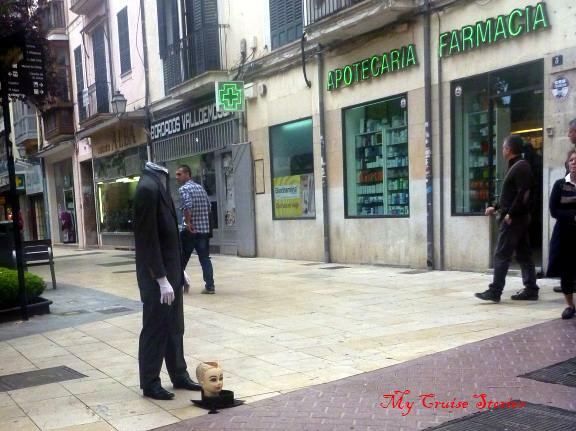 Walking through the touristy area of the old part of town we saw several “headless” people, one of which had a head for his collecting tin. Is he begging for money to buy a new head? Above all other costumes, one very unique one stood out. 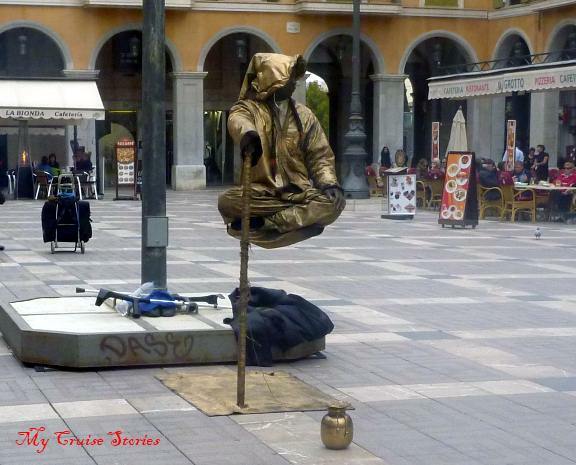 A girl dressed all in gold sat in mid-air, her hand on a pole which provided her only contact with the ground. While she appeared to sit in mid-air, she had a long sleeve covering the arm of the hand holding the pole. She had a square of carpet under her, covering a support base to hold her pole. 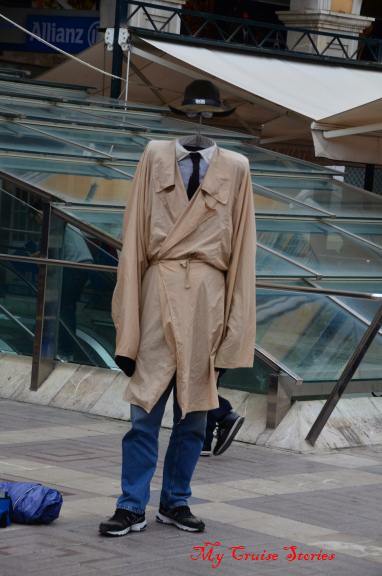 On a closer look, it appeared that something went through her sleeve, an ingenious framework holding a seat which her clothes covered. 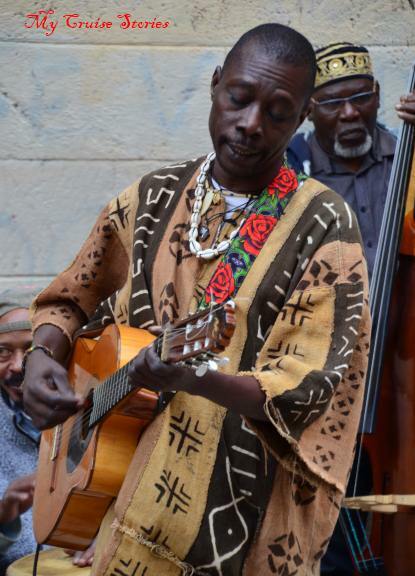 Other beggars perform as street musicians in hopes people toss coins their way in appreciation of the entertainment. Spain is notorious for having pickpockets. We did not lose anything there, but also did not wander the streets after dark, use public transportation, or go to the tourist areas they are most known for frequenting. One scam that the pickpockets use is to hand unsuspecting tourists a sprig of rosemary and then either demand payment for it, or while they are in contact with you as you take it they pick your pocket. We visited Malaga on a rainy day and did not see the beggars in their elaborate costumes there as we had in other places. That’s not to say Malaga does not have any, more likely begging in pouring rain is probably very miserable and not too profitable. We also did not go to any of the major tourist attractions where they would likely hang out in Malaga either. Walking down the sidewalk in a rare non-raining moment on our day in Malaga, we did meet up with a couple women who tried to get us to take a sprig of rosemary. Having heard of this scam before we went there, we refused the rosemary and did not allow them to get close enough to touch us. They did follow us for a bit and try to insist we take it, but keeping a tight grip on our belongings and our distance from them we just as insistently said no until they finally left us to look for easier prey. This entry was posted in Breeze, Carnival, Europe, Port Cities, Ports of Call and tagged beggars, money, photos, pickpockets, Spain, tourists, travel. Bookmark the permalink. Very interesting, I’d never heard that term before. I can’t say that I would want to base my income on the hopes that people passing by would throw money in my tin, but I have heard that even the people in the US that stand on the street corner with signs can make pretty good money. At least they get voluntary donations, unlike the pick-pockets who just help themselves. Sorry to hear they robbed you. I have heard some of them are so good at it that they can empty a pocket without the person realizing they even touched them. That’s why we made sure to stay more than an arm’s length away from the rosemary ladies. In a busy station or attraction with people all around it would probably be quite difficult to keep that sort of distance from everyone though, which is probably exactly why the pick-pockets like those sorts of places. I agree with Shannon. As I was looking at your images, I was thinking of the term “busker”, too. They’re all over NYC. I don’t find them threatening at all. Oten, they can be quite entertaining. If there was one over here that looked like he or she was sitting on air, that one would probably make it into The New York Times. That was impressive. I hadn’t seen them before, but I’ve never been to New York either. We just have ordinary beggars around here. I did see one in Cozumel on the Pearl cruise though. I thought the sand castles in Barcelona were pretty impressive. I think those sand castles belong in the Guggenheim. 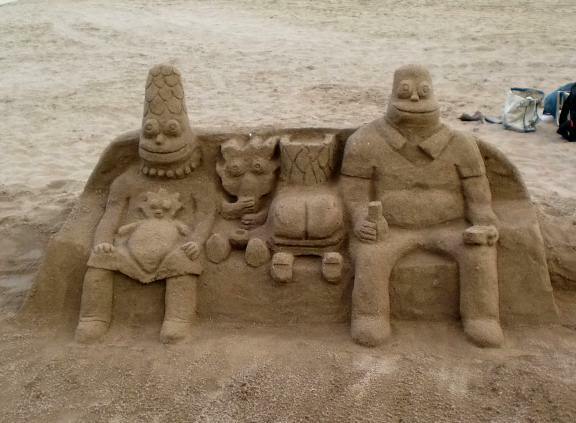 They did the nice sand castles in Boracay, Philippines too. There if you took a picture kids would run up to you with their hands out. We avoided taking many pictures because of that but there were one or two that were especally nice that we did get some pictures of and then pay the kids. They would light them up at night with candles and then the sand castles were even more impressive.